Couples in search of a fertility clinic also need to know how to find the best egg freezing clinic as well. Ideally, the assisted reproductive therapy clinic, laboratory, or egg bank offers the cryogenic freezing of eggs for future use. Unfortunately, neither the CDC nor other government regulations entity collects data on the success rate for freezing eggs. Fortunately, data on pregnancy rates and live birth rates from these procedures are indeed submitted to the CDC. This information is available to the public for free. The difference between choosing an HMO and choosing an ART provider is that the latter can be done using quantitative data from actual results, which demonstrates the value of the CDC reports. Even though egg freezing is not tracked directly by the CDC, cross-checking the fertility clinics with high pregnancy rates and live birth rates can give you an idea about how good they are at not only routine IVF, but also egg freezing. This data also allows you to filter out which fertility clinics to avoid entirely. Numbers aside, every patient or couple dealing with infertility may consult at the clinic with their own set of issues. These health issues may be related to either the male or female partner, and every clinic has a wide variety of patients.Although it is impossible to know exactly your own chances for success, you may be able to estimate your chances by comparing yourself to patients your age at the clinic you choose to consult. Good clinics should have a 50% pregnancy rate or better for the “under 35 years old” age group, with the best clinics having a success rate well above 60%. If egg freezing services is not advertised, it may be a good idea to avoid them altogether. Egg freezing is a procedure that is done in both fertility clinics as well as egg banks. However, it is important to use caution in distinguishing the types of services offered. Some banks or clinics freeze donor eggs and offer them to patients for IVF cycles, whereas other establishments offer egg freezing for patients who want to use their own eggs in the future. It is critical to make this distinction because success rates for egg freezing are generally better for the eggs of donors than for the eggs of patients. 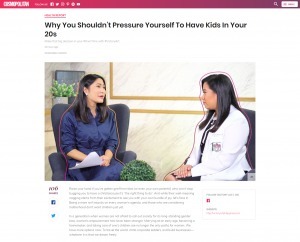 The reason is that egg donors are usually younger women in their twenties, and freezing younger eggs yields better results. On the other hand, patients are typically in their thirties or even forties, and can expect diminished success rates across the board. There is plenty of debate among the medical community about the best method for freezing eggs, whether through slow freezing or vitrification. This is because different clinics have achieved different success rates while using different methods. Higher-volume clinics that not only offer egg-freezing but also have done at least 200 IVF cycles a year with better-than-average pregnancy rates are more likely to have more refined techniques than their less-experienced counterparts.